GJ hits Morzine… | Going to Morzine for the first time? Find out what it’s like through the eyes of a new Simply Morzine staff member! Having spent both summer and winter seasons across the French Alps, I am no stranger to how ski resorts and ski companies operate but was keen to see the Simply Morzine difference. Having already advised and guided potential guests on things like where to stay and our properties, I was looking forward to seeing them all for myself and making sense of the layout of everything I’d seen details of online and been told so much about. For the trip I was accompanied by our own Simply Morzine tour guide and “professional hand holder” Lewis Stott, who has taken on the role of showing our new office staff around resort. We arrived at Geneva airport ahead of schedule after our EasyJet pilot had informed us they had found a “short cut” before being greeted in arrivals by the Simply Morzine drivers. Drivers plural…. We had been expecting to meet 1 or 2 of our Resort Representatives – but were welcomed by no less than 6! They had taken the opportunity to take a break from the resort step up work and practice, en masse, the return airport route that will become second nature over the course of the ski season. Following the short transfer into Morzine, we arrived at the flagship and Simply Morzine original chalet, Chalet des Montagnes. With the finishing touches being made to the annual interseason renovations, modifications and general refresh, the main living area was home to beds, dining tables, chairs, curtains and pillows from all over the chalet. Luckily room 7 had been prepared for my arrival, so I headed upstairs to make myself at home. 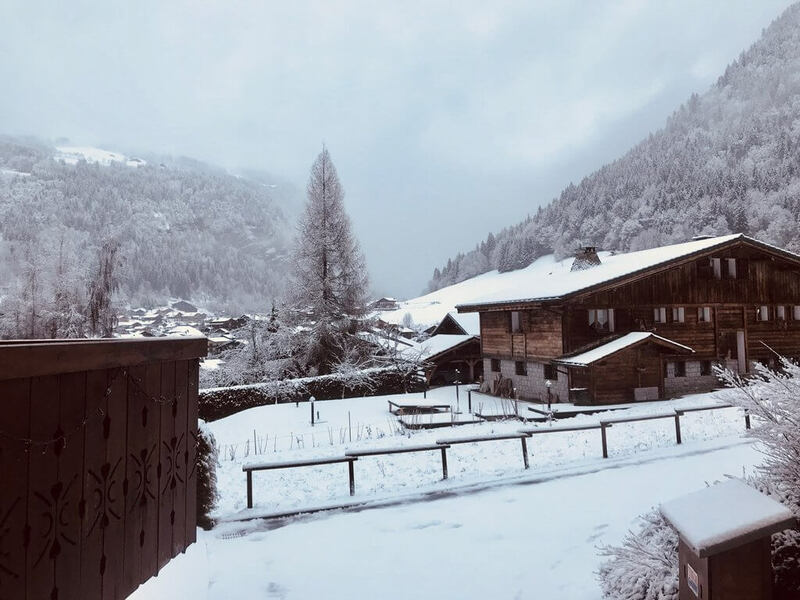 We were then met by Gareth Marshall, the Simply Morzine boss man and Morzine resident for the month of December to ensure everything was up to standard for the arrival of the first guests of the year the following week. Also there were our resort managers Hamish and Rachel, so it would really good to meet them and put faces to names! H & R were very kind and welcoming, which made me feel at ease. After a brief tour of the chalet and giving our ‘expert’ opinion on the repainting of the dining area(! ), we were sent on a whistle-stop tour of the Simply Morzine chalets. We began at the 2 self-catered apartments below and next door to the chalet, before walking up to Chalet Madeleine just a bit further along the road. Then it was back to the town centre for chalets Central, Carving and Coeur de Morzine. By then it was getting towards dinner time and more importantly kick-off for Manchester City versus Chelsea. With Lewis checking the time more and more frequently we popped into a local bar, ô Chalet, which was showing the game and settled down with a well-earned pint. It soon became apparent that the game was not going the way of Man City and so we contacted Gareth to arrange our dinner reservation. We arrived at L’Etale restaurant, Gareth, a regular and Morzine BNOC greeted the owner and we ordered our meals. We all went for escargot (snails) to start and a pizza for the main event. It was easy to see why Gareth and Lewis had chosen this restaurant with its great food, quick service and lively atmosphere. Following the meal, we were then treated to some local after dinner drinks, some older than I am. Sunday began bright and early with a team breakfast, meaning a practice for one of the chefs and a couple of hosts to get used to morning chalet life. We were treated to a cooked breakfast of bacon, eggs and tomato to go with the French bread, croissants and everything else on offer that makes up the ‘Simply’ continental breakfast with hot dish. Feeling full, we jumped into one of the Simply Morzine minibuses and headed off on a tour of the local area. We started just along the road at the Nyon cable car, a convenient link into the Morzine-Les Gets side of the Portes du Soleil ski area. It seemed Skiddy Gonzales, a company many of our returning guests are familiar with because of their airport transfer partnership with Simply Morzine, were having their resort preseason training because the carpark was full of their minibuses. From there we drove up to a snowy Prodains, one of the links to Avoriaz, which is accessed from the other side of Morzine. Les Prodains is accessible in 10 minutes by public bus and is a handy alternative route to the wider Portes du Soleil for those not wanting to ski over to Avoriaz via Super Morzine. Next it was a trip around snowy Lake Montriond, which looked very different to the summer water sports and picnic areas I had seen photos off. This is a real hot spot in July and August and stunningly beautiful and quiet in winter. We headed on up the road to Ardent, another link into the wider Portes du Soleil ski area. It was then back in the minibus and on to explore Les Gets, the next village along from Morzine. Along the main street and just across the road from the nearest lift we found Apartment du Centre, a new property addition for this winter that we’re excited about. The apartment is a great way for the business to expand beyond Morzine. We met the staff at our new partner equipment hire shop in Les Gets, Désiré Sport, which is literally downstairs and where our guests receive a special discount. We then popped upstairs and had a look around the apartment which looked great having just had a full renovation, plus it was dressed and finished beautifully ready for the arrival of our first guests the following week. We spent the afternoon working in the new Simply Morzine ‘temporary office’, Apartment des Montagnes, before heading to Chalet Central, which is next to the ski slopes in the middle of Morzine. Here we indulged in another ‘practice meal’, where we enjoyed the full 4-course Simply Morzine dining experience – complete with welcome drinks and the free-flowing wine and beer enjoyed by all guests staying at our catered chalets. With 20 members of staff cosily squeezed around a table meant for 16, we were treated to a meal to remember. As the main event – confit duck with pomme puree, assorted veg and a brilliant sauce – was cleared away, the wine tasting began, and talk turned to fruity undertones and floral notes. With no one able to agree on a favourite wine, we were quickly distracted by the homemade lemon tarte for dessert. The very best thing about today for me was that it started to snow in Morzine, a lot! Heavy, fluffy snowflakes began falling while we were eating – and by the end of the meal there must have been close to 10cms outside the chalet. Morzine has turned into a winter wonderland and it looked amazing. Winter was officially here, and I felt right at home. The mountains are part of my DNA and in that moment, everything was perfect. Monday began with another practice breakfast, this time at Chalet Carving, with a hot dish of made to order pancakes and of course all the continental favourites. Then it was a tour of more of the new property additions for Simply Morzine. First it was off to Chalet Petit Central, the “mini me” of Chalet Central, which was nearing completion having been built just next door over the past year or so. This stunning little self-catered chalet is obviously brand new and designed for the purpose, so it looked pretty unique to me. This has to be the ideal little self-catered chalet in Morzine. With everything very nearly ready and after all the hard work, it was a chance for Gareth, as well as us, to see how the finished chalet would look and function. The built was a big project for Simply Morzine to manage, but I could tell the hard work would be worth it. This is big news in ski industry and takes us to the next level in our winter holiday offerings. And there’s more to come. Much more! We then across town to “Chalet Zormine”, which is in the centre of town and almost next to the Super Morzine lift. It’s an incredible location. 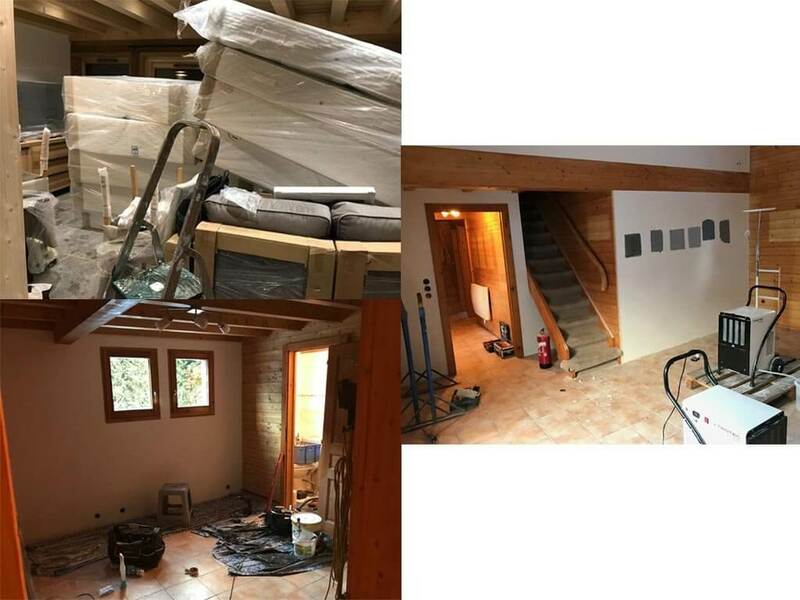 This is another new build chalet, but in the early build stages so isn’t ready yet – but will be added to the Simply Morzine catered chalet accommodation portfolio for winter 2019/20. It’s still a wood and concrete framework at this stage, but I’m told building work is ahead of schedule ready for a grand opening prior to next season and that the chalet is already open for bookings and will be added to the Simply Morzine website soon. Chalet Zormine is set into the mountainside overlooking the Parc des Dérêches and Morzine suspension bridge and is set to be something very special. It’ll even have a rooftop hot tub, so my advice is that you don’t want to miss it. Like Chalet Petit Central, it appears that the Simply Morzine plan is to raise the bar when it comes to chalets in Morzine. The afternoon and evening were spent meeting more of the local companies Simply Morzine work alongside and contribute to the famous ‘Simply’ holiday experience. It is these small touches that set us apart from the competition. First, it was a trip to Felix Ski Shop, who we recommend to all our Morzine guests. It was great to meet owners the Rosset family who I’m told are a Morzine institution. I can now see why people talk about friendly personal service, Felix’s firm handshake, Guillaume’s modernity and Brigette’s warm loving smile. It’s just a shame I didn’t get a chance to try her Tartiflette which I’m told is the best in the Alps! We had a look around the shop and I especially enjoyed eyeing up their range of skis, boards and boots for sale. Next it was on to Hotel la Chaumiere, a charming family-run French hotel and main accommodation for our flexible short breaks. It was great to meet owners Michele, Frank, Margot and Julian Blanchi, who like the Rossets, could not have been more welcoming. I can sense that all this is so sincere, and I guess that’s the secret to our success. With everyone associated with Simply Morzine, it’s about going the extra mile and a genuine desire to give guests the best possible holiday they can. After a quick tour of the hotel rooms, hello to the team, whizz around the swimming pool, restaurant and bar, we headed to Chalet Carving for another ‘practice dinner’. There just weren’t enough hours in the day. On the invite list for tonight’s supper were some more of our English-speaking suppliers, so it was good to spend time with them as well. Our transfer providers Skiddy Gonzales and ‘Morzine and Back Transfers’ as well as the bosses from Mint and BASS ski/snowboard schools all sampled the culinary delights being prepared by George. He’s another of our chefs who has done many seasons in the past but is looking forward to the chance to express himself more and to write his own menus for this winter, having been confined by set company menus in the past. George also told me he’s worked in several upmarket restaurants and hotels and the enjoyment and care he took were evident as everything received rave reviews, from canapes all the way through to dessert. 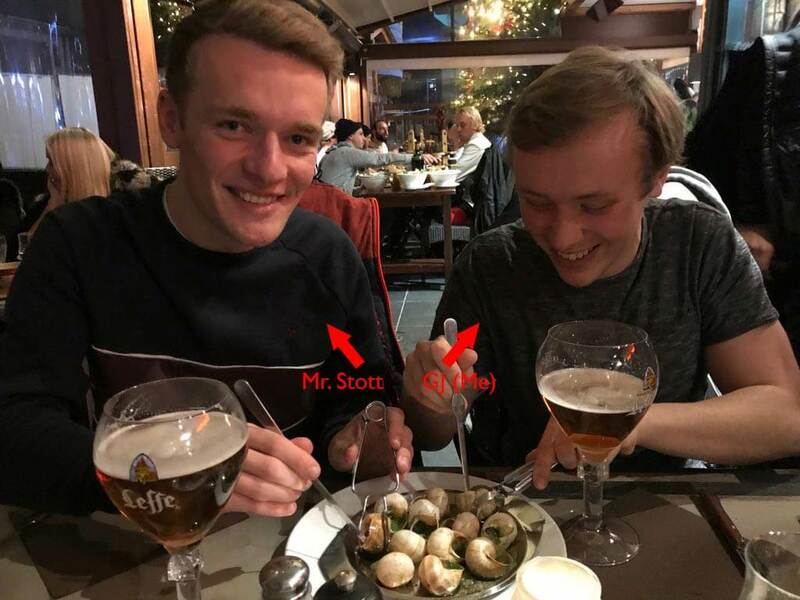 It was clear to me that George, and the rest of the Simply Morzine chefs whose food I’ve been lucky enough to experience, are the real deal when it comes to chefs. Dining with Simply Morzine is certainly something to behold! After dinner, the last stop on our tour was the much-anticipated staff “Villa” (called the Villa so it doesn’t get confused with any of the chalets!). The Villa is where most of the Simply Morzine team live for the season. I know too well what seasonaire accommodation is all about and this place is like a palace compared to the places I lived in! Plus, it’s in the centre of Morzine, so it’s fair to say that anyone working with Simply Morzine gets a great package to go with the job. As this Tuesday would be the only day of the entire season when all of the Simply Morzine team had the same evening off, everyone was excited at the chance to relax and socialise together. Some of the team headed out into town to sample the local bars, however Lewis and I headed back to the chalet because we had an early start the following morning with a 6am transfer back to Geneva in time for our flight home. With all the Simply team enjoying a well-deserved lie in on their morning off, we were greeted outside the chalet bright and early by our Skiddy Gonzales driver and I slept all the way to the airport. I think its fair to say the trip made me wish I was back out working in the Alps this winter, living in Morzine and meeting all our guests. Like so many others, it appears I’m a Morzine convert and I just wish I’d visited sooner! I can’t wait to get back out for a holiday at some point this season. Happy skiing to all Simply Morzine guests!